Nepalese officials say they will introduce regulations banning inexperienced climbers from attempting Mount Everest in an attempt to improve safety and maintain the “glory” of the summit. Kripasur Sherpa, the country’s tourism minister, said he hoped to implement the rules in time for the spring season, which usually sees hundreds of mountaineers from across the world attempt to reach the 29,029ft (8,848 metres) summit of the world’s highest peak. 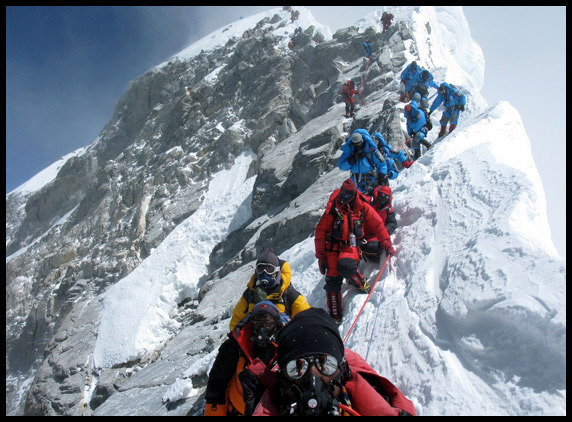 Permits to climb Everest will only be given to those who can prove they have already scaled mountains that are higher than 6,500 metres, officials said. Disabled, old and very young people also face bans. “We cannot let everyone go on Everest and die. If they are not physically and mentally fit it will be like a legal suicide,” he said. “The disabled or visually impaired people usually need someone to carry them, which is not an adventure. Only those who can go on their own will be given permission.” The permits cost thousands of dollars and are a key source of revenue for Nepal. It is unclear how the demand for “proof of competence” might be enforced. Every year about 600 climbers come to Nepal hoping to reach the summit, creating a multimillion-pound industry and bringing problems of overcrowding.